Bring medium pot of water to boil and add potatoes. Boil for 20 minutes or until tender. Drain. When cool enough to handle, cut into quarters. In small bowl, stir together butter, 1 tablespoon chives, shallot, and garlic. Season with salt and pepper. Cover and place in refrigerator until ready to use. In large bowl, whisk together Dijon mustard and red wine vinegar. Slowly whisk in olive oil. Season with salt and pepper. Add in potatoes, 2 tablespoons chives, parsley, basil, and scallions and stir gently to combine. Season with salt and pepper. Heat lightly oiled grill pan over high heat. Season steaks with salt and pepper. Grill for 3 minutes per side for medium rare. 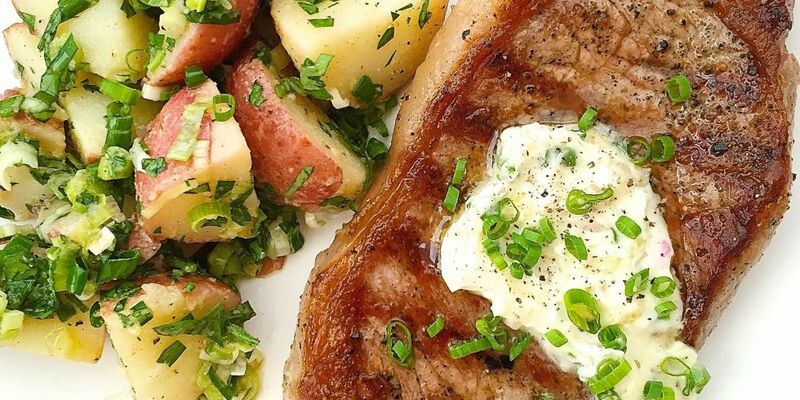 Place dollop of chive butter on each steak and let rest a few minutes. Serve with potato salad.